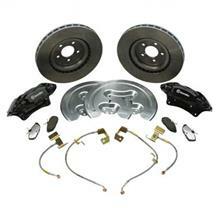 Upgrade your brakes for better stopping power with Late Model Restoration's 2005-2009 Mustang brake kit. 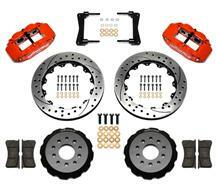 These kits from Brembo and Steeda are the perfect performance brake kit for street, strip, and track Mustangs. Choose from 13" and 14" rotor kits that include stainless steel brake lines for added performance. 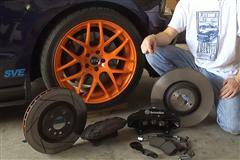 Are you contemplating adding a big brake kit to your S197 Mustang? 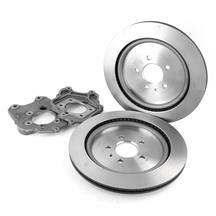 Then you don't want to miss out on our brake tech articles and installation videos. We walk you through the installation of the Ford Racing M-2300-T Shelby GT500 Brembo six piston brake kit install. 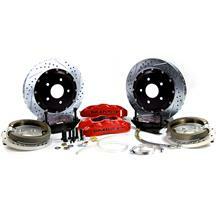 Add some serious stopping power to your Stang with the help of LatemodelRestoration.com! Want more stopping power and decreased stopping distances? 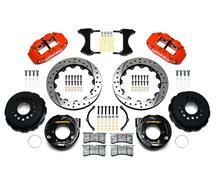 Pick up a performance 05-09 Mustang brake kit from LatemodelRestoration.com. 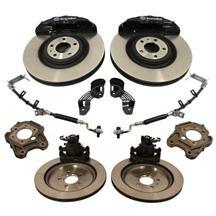 With bigger rotors, performance calipers, and stainless steel brake lines, these kits are a huge upgrade over stock brakes.